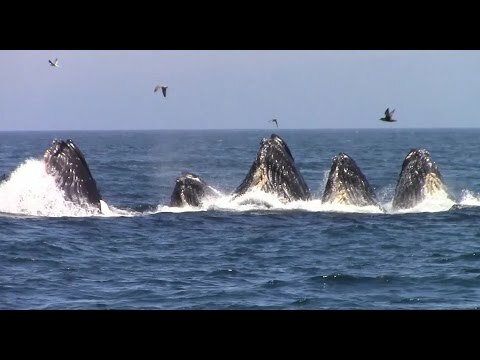 People flock to Maui in the winter to see the whales, but in the past few years the Whale Watching in Northern California has been off the charts. A NOOA study reports the water is warmer causing an upwelling of krill and anchovies where the deep water ocean trench hits the Monterey coast. 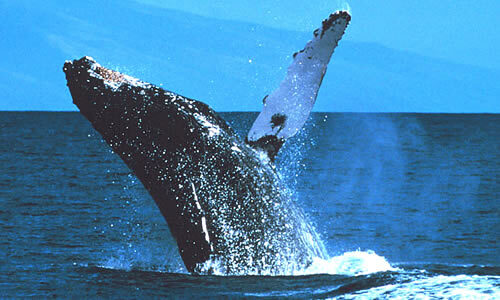 The whales have always just passed by, heading to feeding grounds in Alaska. Recently, when they got to Monterey they seemed to say. “Hey this is very cool, plenty of food, not so cold and it’s not another 2,000 miles north. Let’s stay.” And they did. So in October 2015 went to Monterey to see what could be seen. 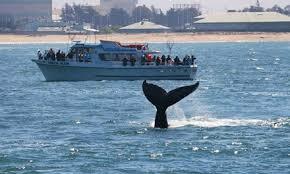 Our first stop on our whale watching journey was Moss Landing. 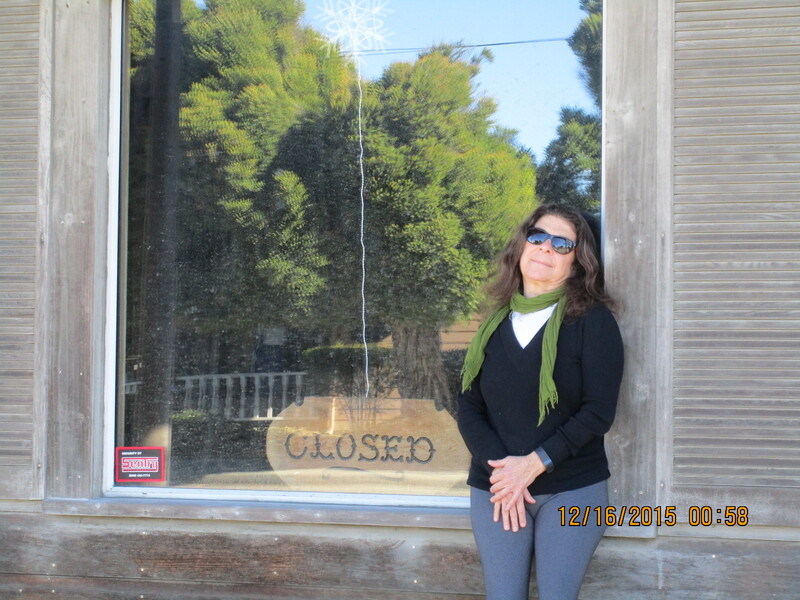 Some time ago, we had discovered Hamlin Antiques, run by an interesting quirky guy in a classic historic western storefront, which we described in the first verson of this post. Alas, on this trip, the store had closed. Disappointed and hungry, we glanced up and saw a restaurant across the street, Haute Enchilada Café We had a very good meal on the patio at Haute Enchilada. Near the end of our meal, an older man rode up on a bike carrying a big handful of mail. He stood at the edge of the patio alternately surveying the scene and flipping through the mail, like he was trying to decide which table to choose. 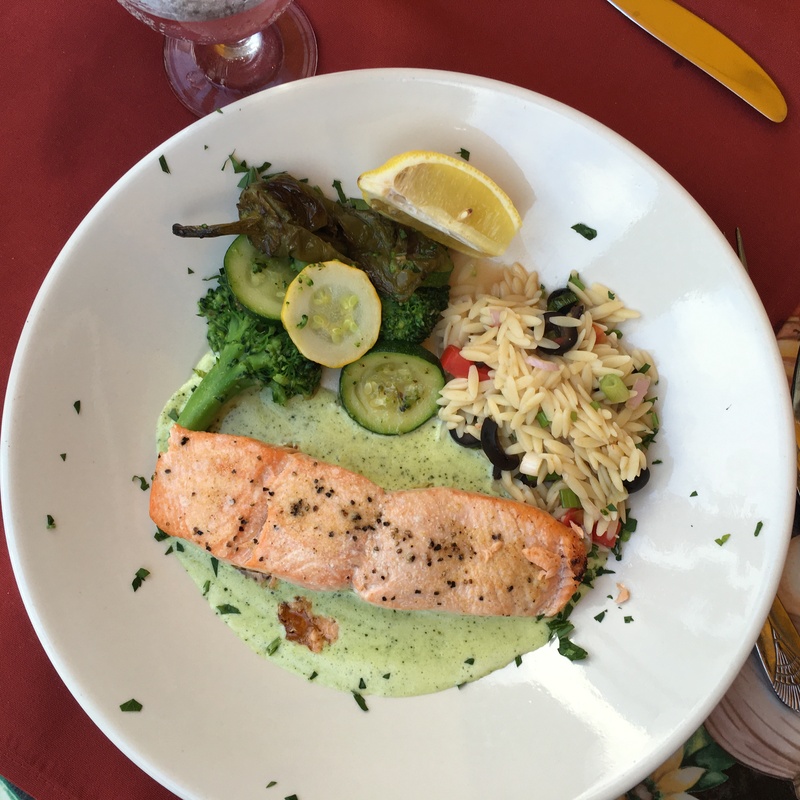 We were chatting with Rey Retez who, in 1979 when he bought the Moss Landing Inn and turned it into a restaurant. These days, he lives upstairs above his daughter’s restaurant. He has been here for 35 years and it feels like the whole town is his living room. We shook on our deal and he wandered off around the back of the restaurant. 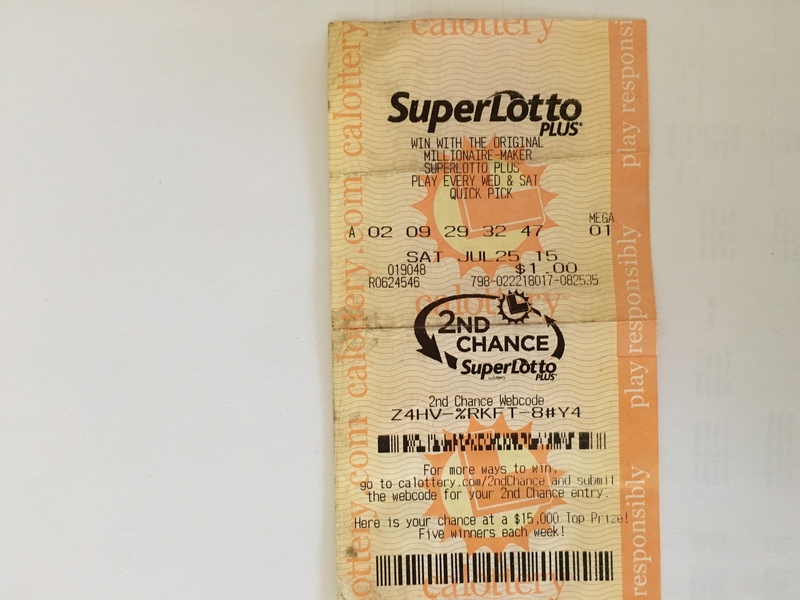 Only later did I noticed that this was a second chance ticket that doesn’t cost anything. It is like a consolation prize but it could be worth $15,000 though there’s only one winner a week from among all the tickets sold. We headed off to our destination, California State Park and Conference Center at Asilomar, on the coast in Pacific Grove, just south of Monterey. 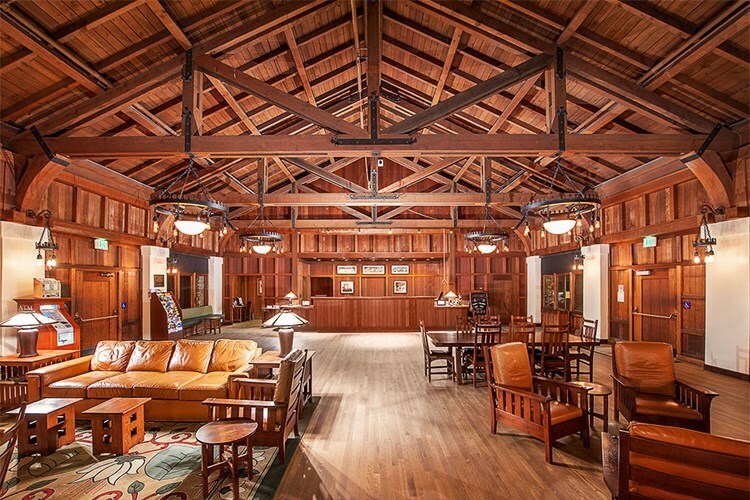 The facility was originally sponsored by Phoebe Hearst, with historic buildings by architect Julia Morgan and ultimately donated to the State of California for use as a hotel and conference center. There are beautiful grounds and it is just steps away from a wonderful beach. The setting, on the beach, the dunes and the forest is unmatched and the prices are reasonable. We’ve gone there on our own, for a family wedding on the beach and took a group of our adult kids for a weekend when we reserved one of the lounges scattered throughout the campus for evening snacks and games. There are great rooms, and good rooms. We’ve visited many times, but had yet unlocked the secret of consistently getting the great rooms. During a quiet moment at the front desk, we asked the desk clerk how one manages that. She said that room assignment is a difficult juggling act, especially with large groups that want to be together. Individuals can get shuffled around. She paused, and in a conspiratorial tone, let us in on the secret. If you ask the person on the phone making the reservation for a particular kind of room, they will cheerily say yes, but it doesn’t make a bit of difference. They’re in a call center and your request doesn’t get registered. She told me that after I make the reservation, I should call the front desk, not the call center, and make my request. Then call the desk again the evening before to confirm the request. Knowing which rooms are good helps as does getting there early. Since our luncheon encounter with Rey was late that afternoon, we weren’t ready for dinner, so we took a long walk south along the ocean on a trail that followed the 17-mile Drive. You have to pay to drive the road, but there’s a 7-mile trail and it’s free. 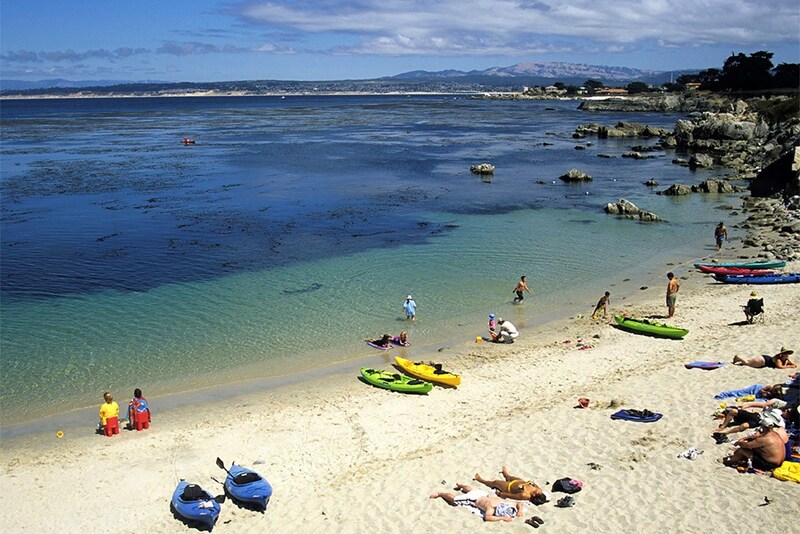 The first three miles is a beautiful stretch of ocean, beach, rocks and kelp beds. On one of the exhibits that are dotted along the route, we are told that, because of the earth faults, this part of the shore was off Los Angeles 2 million years ago. That’s almost 1/8” per year. If you are very quiet, you can almost feel it move. 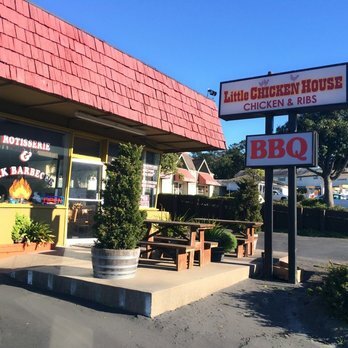 Earlier in the day, we passed The Little Chicken House, a drive through BBQ stand. More than a few times during our walk, one or the other of us brought up how much we were looking forward to that delight. However, after going back to our room and cleaning up as bit, our fatal error, we arrived to find The Little Chicken House was closed. We missed them by 10 minutes. Now in the universe of life’s disappointments, this was a very small, even infinitesimally small, first world disappointment but we were determined to figure something out. We drove in circles for a bit, saw a two restaurants but both seemed more than we wanted; we wanted the Little Chicken House! Finally arriving at Safeway, we couldn’t quite bring ourselves to settle for their last sad bag of roasted chicken. It came down to the French place or Vito’s the Italian restaurant. Vito’s won. That was Vito. Vito was out front and his wife cooked. 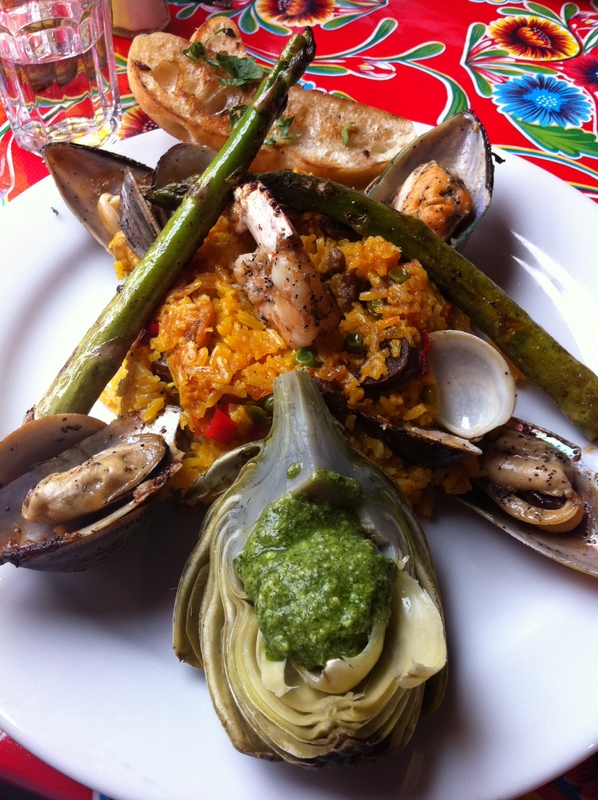 The menu was very traditional Sicilian, with no hint of modern cuisine. Simple and good. This is the kind of family restaurant that people come every Sunday night, where birthdays and engagements are celebrated. Only one other couple came in while we were there. Throughout the meal we had a rolling conversation with Vito. 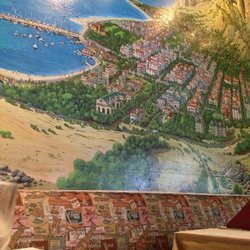 His family was from Castellammare del Gulfo, a Sicilian seaside resort town just west of Palermo, the town portrayed in the mural. He still has family there and returns often. He has run the restaurant for 25 years and could quote the number of covers he served on a good night and how that had declined in recent years. 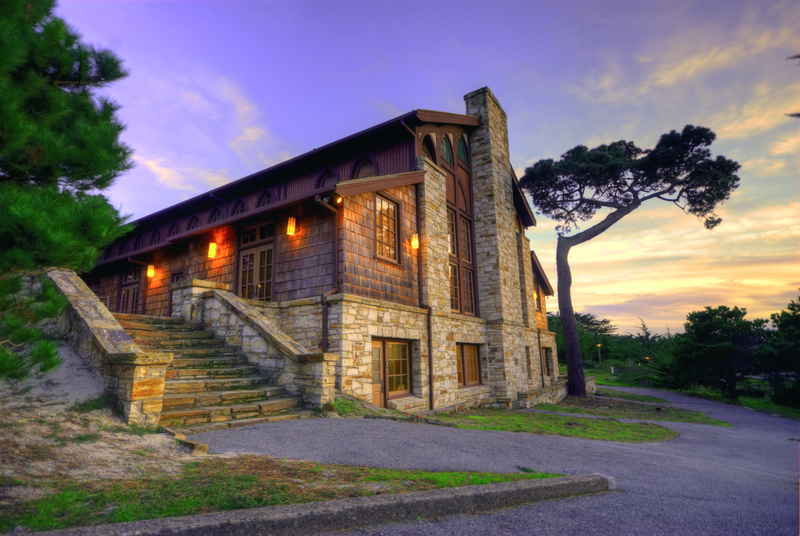 First came the recession, but even before that, the face of Pacific Grove was changing. It has become a sought after high end vacation and retirement destination. Families grew up and the old time residents have been leaving. There are fewer families, local schools are closing and more people live there only part time. His client base is disappearing and tastes in restaurants is changing. Should he change with the times, at the risk of losing his remaining customers, or can he survive until he can retire to Sicily. 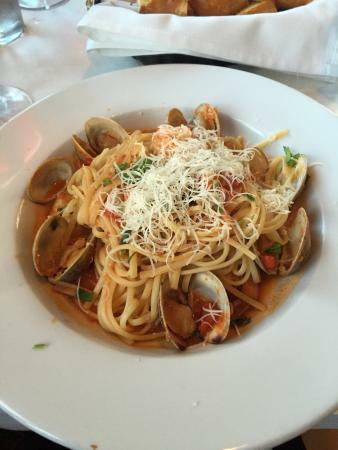 Until then, visit for a good traditional Sicilian dinner. The next morning, we were off for the main event of this trip, whale watching. 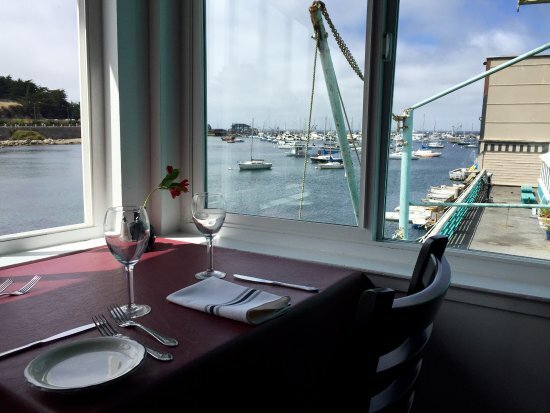 We went with Chris’s Whale Watching from the Monterey Fisherman’s Wharf. Their boat was smaller than the big operators and is operated by fishermen. Once we were on the water, it was clear that they knew what they were doing and, through their fisherman network, knew where the whales were. We saw at least 30 whales breach. They were lunge feeding on huge schools of anchovies. 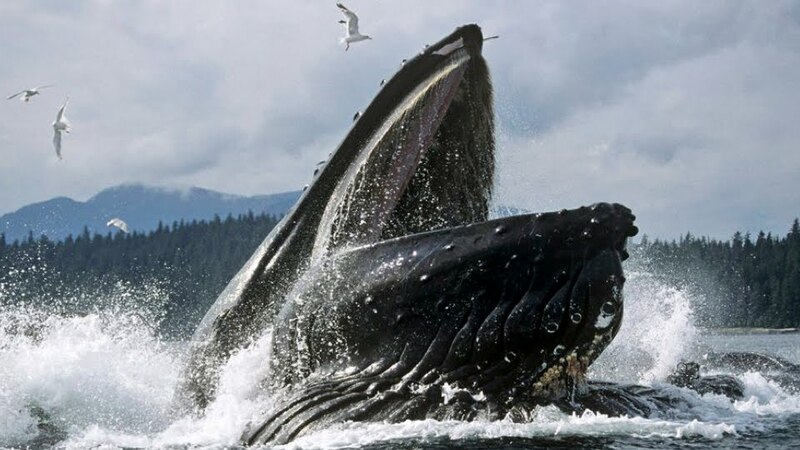 Groups of whales would rise from the water at the same time with their mouths wide open and scoop up a huge amount of water and fish and then come crashing down. We also saw thousands of dolphins, seals and sea birds all in a massive feeding frenzy. It went on and onand on. The link to their site has great videos. That’s what we really saw and more. This was the most amazing day of whale watching I have ever experienced, really. As we approached the dock we had an overwhelming desire for fish and chips. You can all understand that. 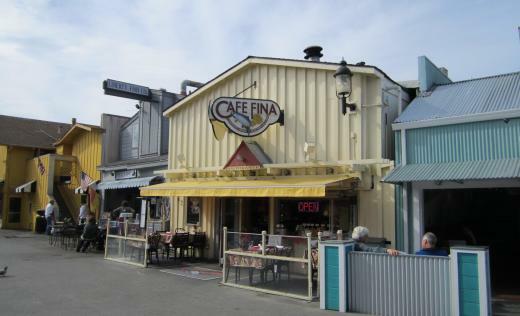 The captain recommended Café Fina just across the pier. We wouldn’t normally expect good food in such a tourist place, but he assured us that it was the best fish and chips in town. Café Fina avoids the ropers out front with their pitch of free calamari. Instead, there was a young woman who asked if she could answer any questions. She charmed many in the door. We sat at an outdoor table and watched the passing parade, trying to make up life stories about each passing group. Our captain was right, the fish and chips was great as was everything else we have had in subsequent visits. As we ordered our second glass of wine a middle-aged man in an apron came out and asked how the meal was. There wasn’t a spot on the apron. 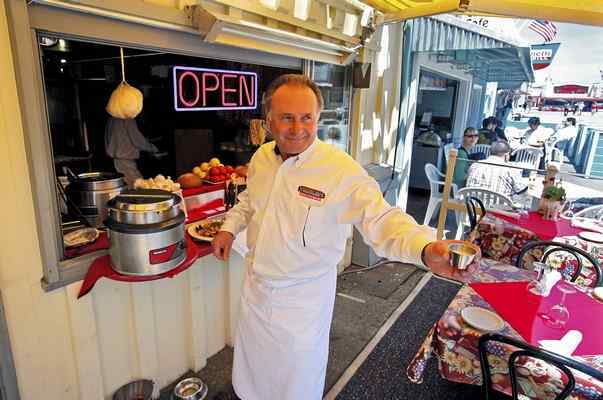 He wasn’t the cook; in fact, he was Dominic Mercurio owner of Café Fina and Domenico’s across the way. 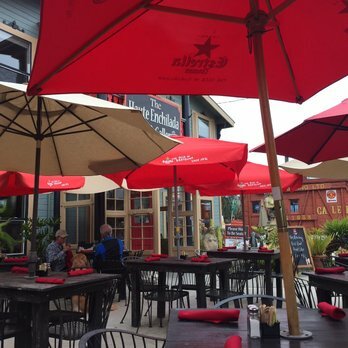 We had a long conversation about the business and, how he started the two restaurants, his Italian fisherman father who immigrated to Monterey as a young man and his mother who lived in the same house he grew up in just up from the pier. 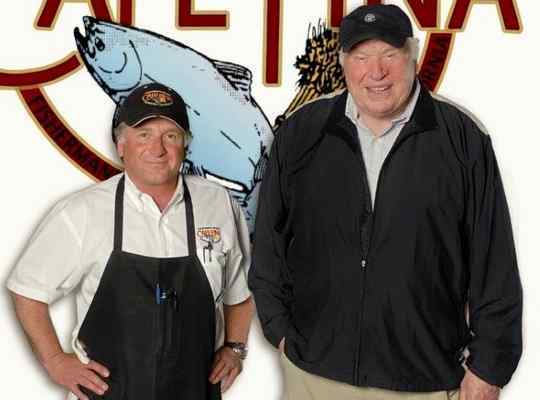 He was pretty proud and happy to tell the story of how John Madden happened into his restaurant. Somehow they hit it off and they have become fast friends and business partners ever since. They’re partners in a farmland in the Salinas Valley growing almonds and produce for the restaurants, not to mention a venue for duck hunting. They keep all the ducks for a once a year blow-out meal with his friends. Apparently, Dominic goes each year with Madden to Canton and cooks. When I mentioned this to a friend, he said, “Yes, Madden talks about Dominic all the time on the air.” Who knew! One thing led to another and we were talking about other restaurants in the area. He didn’t know Vito but when we mentioned Haute Enchilada, he said, “Did you meet Rey?” We said we had and were, in fact, his business partners and showed him our lottery ticket. He laughed and told us that Rey had made the same offer to John Madden. 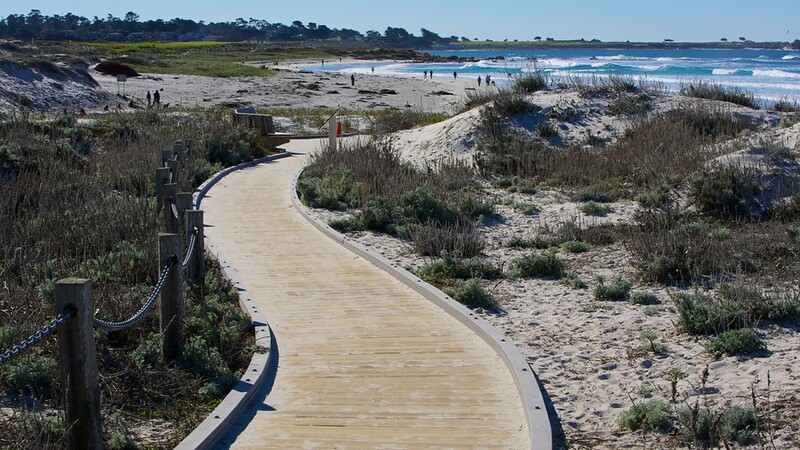 We went back to Asilomar, took a nap, then another walk on the beach, all in preparation for an on-time arrival at The Little Chicken house. There’s absolutely nothing fancy here. 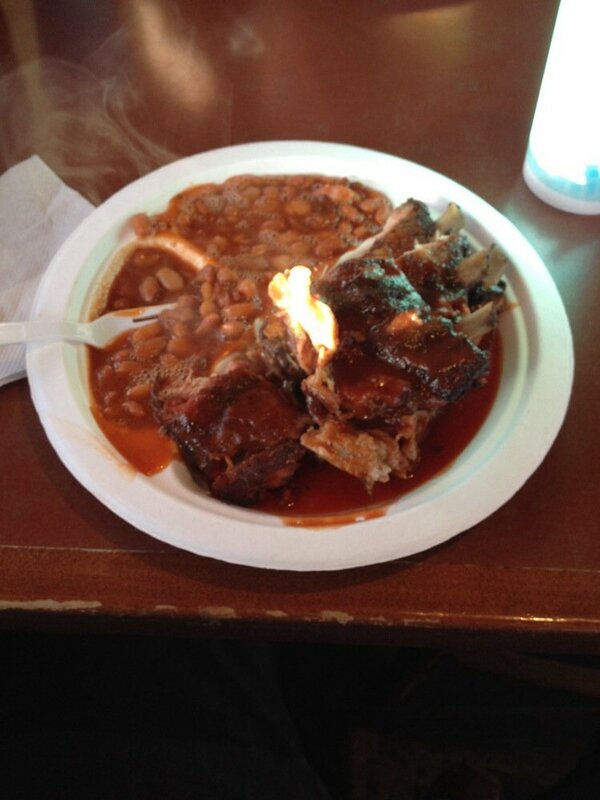 Yelpers give them mixed reviews, about service; not quite the right sauce, not Texas enough, too Texas, blah, blah, blah. 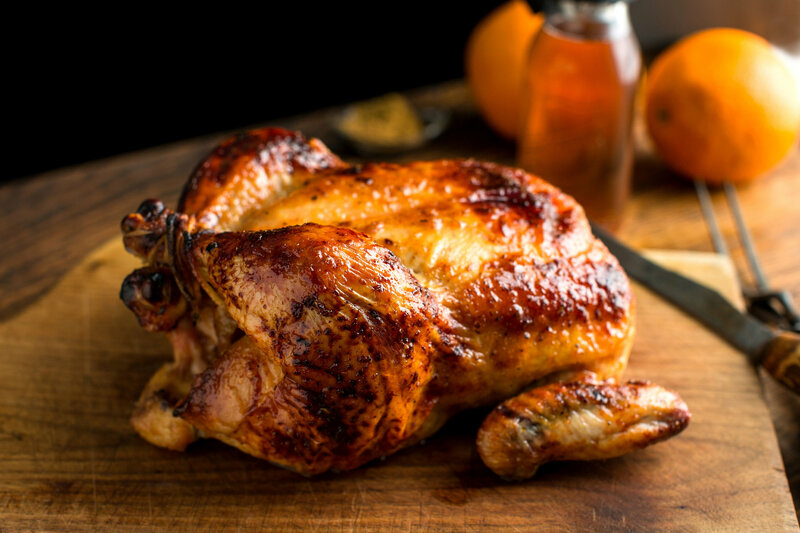 Get over yourself, this is good simple food. We got carried away, a big serving of chicken, ribs, fries, coleslaw and biscuits. Tasking it all back to our room, we put a towel on the bed and consumed our feast while watching a movie. There was no way we could eat it all, but we tried. We came for the whales and stayed for the chicken.